Ukrainian Catholic Church in Great Britain [Українська Католицька Церква у Великій Британії] – a religious organisation of Ukrainian Christians in Great Britain belonging to the Byzantine Catholic rite. Part of the worldwide Ukrainian Graeco-Catholic Church (UGCC) – see below. The earliest significant group of Ukrainian immigrants in Great Britain, those who settled in Manchester between the 1890s and the outbreak of the First World War, were mostly Graeco-Catholics. They initially attended services at the Roman Catholic church of St Chad, and later joined the parish of St Casimir, which was established in 1904 to serve, primarily, Manchester’s Polish and Lithuanian immigrants. After the closure of this parish in 1931, St Chad’s once again became the main place of worship for the Manchester Ukrainians. From 1932 the Rev. Louis van den Bossche, a Graeco-Catholic priest from Belgium, visited St Chad’s several times a year to celebrate mass according to the Graeco-Catholic rite. After his death in 1938 these visits were continued by the Rev. Jacques Perridon from France (1938-39 and 1944-47). Between the First and Second World Wars a number of high-ranking figures in the UGCC made visits to Great Britain: the Metropolitan of Galicia, Andrei Sheptytskyi (1921), Bishop Mykola Charnetskyi, the apostolic visitor for Graeco-Catholics in Poland outside the boundaries of Galicia, (1932 and 1937), and the Rev. Yosyf Slipyi, rector of the Graeco-Catholic Theological Academy in Lviv and future head of the UGCC (1935). During and immediately after the Second World War (October 1944 – September 1945, and January-February 1946) the Rev. Michael Horoshko from Canada served as a military chaplain for the Ukrainian Graeco-Catholics in the Canadian armed forces based in the UK (see Ukrainian Canadian Servicemen’s Association). There were also chaplains for the Ukrainian Graeco-Catholics in the Polish Armed Forces under British command: the Rev. Anthony Hodys in the Polish I Corps based in the UK, and the Rev. Stepan Kolankiwskyj in the Polish II Corps which was transferred to the UK in 1946. The process of organising the Ukrainian Catholic Church (UCC) in Great Britain (UCC-GB) began during the large-scale influx of Ukrainians into the country in the immediate post-war years (see Ukrainians in the United Kingdom). In November 1946 the Rome-based Bishop Ivan Buchko was appointed Apostolic Visitor with personal jurisdiction over Ukrainian Catholics throughout Western Europe. The church in Great Britain was initially assigned to the jurisdiction of his Vicar General (Syncellus) for France, the Rev. Perridon. In February 1947 the Rev. Josaphat Jean, a French-Canadian priest of the UGCC, was appointed parish priest for London, and subsequently he became dean of the Ukrainian Graeco-Catholic Mission in Great Britain. In March 1949 Bishop Buchko established a separate vicariate general for England and Scotland and appointed the Rev. (later Bishop)Volodymyr Malanczuk as the first vicar general of the UCC-GB. In January 1951 the latter was succeeded by the Rev. Alexander Malynowskyj. In December 1947 the Roman Catholic hierarchy of England and Wales established a committee for the welfare of Catholic European Voluntary Workers of various nationalities who were arriving in the UK. This committee provided assistance to the UCC-GB in such matters as the admittance of Ukrainian priests to the country, arrangements for visits by priests to camps and hostels in which Ukrainians were living, and the use of Roman Catholic churches for Ukrainian services. In June 1957 the Vatican established the Apostolic Exarchate for Ukrainian Catholics in England and Wales (within the Eastern Churches an exarchate is an administrative unit headed by a bishop with personal jurisdiction over a group of the faithful not sufficiently large or stable to be constituted as an eparchy, or diocese). William Godfrey, the Roman Catholic Archbishop of Westminster (and Сardinal from 1958), was appointed as the first Exarch, while the day-to-day administration of the Exarchate rested with his Vicar General: initially the Rev. Malynowskyi, then, after his death in November 1957, the Rev. Paul Maluga from Canada. In August 1961 the first Ukrainian Graeco-Catholic bishop in Great Britain, Augustine Hornyak, was appointed Auxiliary Bishop to the Exarch (installed in December), and in April 1963, after the death of Cardinal Godfrey, Bishop Hornyak was appointed Exarch (installed in June). By a decree of March 1967 the jurisdiction of the Exarchate was extended to include Scotland (with effect from May 1968), and it was renamed the Apostolic Exarchate for Ukrainian Catholics in Great Britain. A conflict which arose within the exarchate in 1975 (over the issue of patriarchal status – see below) led to the resignation of Bishop Hornyak in September 1987, and the appointment of Bishop Michael Hrynchyshyn, the apostolic exarch of France, as administrator of the exarchate in Great Britain. A new exarch for Great Britain, Bishop Michael Kuchmiak, was appointed in June 1989. He remained in this position until his retirement in April 2002 and was succeeded by Bishop Paul Chomnycky. In January 2006 Bishop Chomnycky became bishop of the UCC eparchy of Stamford, USA. As a result, the position of exarch for Great Britain became vacant and the Rev. Benjamin Lysykanych became administrator of the exarchate. In June 2009 Bishop Hlib Lonchyna became administrator of the exarchate, before being appointed exarch in June 2011. In January 2013 the exarchate was elevated to the rank of an eparchy (equivalent to a diocese in the Western Church) with the title of Eparchy of the Holy Family of London, and Bishop Lonchyna was appointed as the first eparch. In December 2014, after the death of the apostolic visitor for Belarusian Graeco-Catholics outside Belarus, the Belarusian Graeco-Catholic Mission in Great Britain was attached to the UCC eparchy of London. In May 2015 the first council (sobor) of the eparchy took place, attended by the bishop, priests and representatives of the laiety of various parishes. In 1947 the territory of Great Britain was divided into six pastoral regions, with one or more priests assigned to each region. In some of the camps housing large numbers of Ukrainians huts were converted into chapels for the conduct of church services. One such chapel, established at Hallmuir Camp near Lockerbie in Scotland, is still used by local Ukrainians. In 1948 the UCC-GB acquired its own church for the first time, in London. From the end of the 1940s, as the camps and hostels began to be closed down and Ukrainian communities were established in towns and cities around Great Britain, the territorial organisation of the UCC-GB was adapted accordingly. Churches (usually redundant buildings of various Christian denominations) and residential premises for priests were gradually acquired in places with larger Ukrainian communities. From these centres each priest served his local community and one or more communities in nearby towns and cities, an arrangement which continues to this day. In towns and cities where the UCC-GB does not have its own church, services are generally held in local Roman Catholic churches. In all, the UCC-GB acquired churches in 17 locations (some have subsequently been sold): Bedford, Bolton, Bradford, Coventry, Derby, Edinburgh, Gloucester, Halifax, Leicester, London, Manchester, Nottingham, Oldham, Peterborough, Rochdale, Scunthorpe and Wolverhampton. In 1967, with the financial support of Ukrainians throughout Britain, a church was bought in central London to serve as the cathedral of the UCC-GB (officially opened on 29 June 1968). 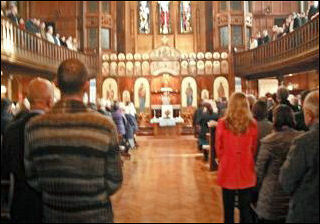 The only purpose-built Ukrainian Catholic church in Great Britain was erected, in the Byzantine style, in Wolverhampton (consecrated in 1988), although the interiors of other churches were adapted for Byzantine-rite services wherever possible. In the 1970s regular services were held in approximately 70 towns and cities, usually every week in parishes with their own churches, and once or twice a month, or less frequently, in the other locations. In 2017 services were being held in over 30 locations. Since the Second World War close to a hundred priests have served with the UCC-GB (excluding occasional visits by priests from Ukraine and other countries), the number in any given year ranging in the main from 10 to 17. Between 1946 and 1948 at least 16 priests came to the UK from continental Europe: in 1946, in addition to the Rev. Kolankiwskyj, two other priests arrived with the Polish II Corps from Italy (John Dumycz, Vladimir Pashkowsky); in 1947, as well as the Rev. Jean who came from France, four military chaplains arrived with the former soldiers of the Galicia Division from Italy (Alexander Babij, Emanuel Korduba, Alexander Markewycz, Michael Ratushynskyi), and the group was also accompanied by two civilian priests from Rome (Vladimir Dzioba, Petro Diaczyszyn); in 1948 six priests arrived from displaced persons camps in Germany and Austria (Justyn Hirniak, Mykola Habak, Jarema Hawryluk, Damian Lopatynsky, Wasyl Paslawskyj, Isidore Patrylo). All of the above priests had been ordained before or during the war, mainly in Western Ukraine. Some of them went on to serve in the UK for many years, while others emigrated to other continents after a relatively short stay. From 1949 priests continued to arrive from time to time from other countries and served in Britain for varying lengths of time. Most of those who came in the 1950s had been born in Ukraine but had completed their theological studies after the war in Rome or at the Graeco-Catholic seminary in Culemborg in the Netherlands. The priests who came in the 1960s-1980s were predominantly from countries further afield (mainly North or South America), to which they had emigrated after the war, or in which they were born. Since the 1970s at least 13 sons of post-war Ukrainian immigrants to the UK have become priests of the UCC, most having trained in Rome, and have served or continue to serve in parishes in Britain. Of the new priests arriving in Britain since the 1990s, most have come from Ukraine. In mid-2017, the clergy of the eparchy numbered 18 priests (including one retired) and a deacon. Since the establishment of the UCC-GB the priests who have served in it for the longest duration (15 years or more) include the following: Alexander Babij, Ivan Bilyk, Andrij Choma, Wolodymyr Choma, Vladimir Dzioba, Ivan Hasiak, Jarema Hawryluk, Mykola Korchagin, Irineu Kraiczyi, Eugene Kushko, Augustine Kuzma, Josaphat Lescesen, Benjamin Lysykanych, Alexander Markewycz, Mykola Matyczak, Ivan Muzyczka, Antin Mychalskyj, Stephan Oracz, Wasyl Paslawskyj, Lubomyr Pidluskyj, Michael Ratushynskyi, Jaroslaw Rij, Stephan Soltys, Theodore Tysak, Stephan Wiwcharuk. The number of Ukrainian Graeco-Catholics in Great Britain has varied significantly over the years since the Second World War. Most of the 34,000-36,000 Ukrainians who arrived in the UK during and immediately after the war came from the parts of Western Ukraine where the UGCC was predominant, and the total number of Graeco-Catholics among these immigrants was probably about 25,000. In 1949 the Vicar General’s office began the registration of individual members of the church, and by the end of 1950 the number of registered members was over 18,000. In subsequent decades the number of Graeco-Catholics varied as a consequence of several factors, in particular the onward emigration of many Ukrainians to other countries in the 1950s, on the one hand, and the arrival of about 1,500 Ukrainian women (mostly Graeco-Catholic) from Poland and the former Yugoslavia in the 1950s-1970s, on the other. Beginning in the late 1980s, the number of Graeco-Catholics in the UK has significantly increased as a result of the new wave of immigrants from Ukraine. In the initial post-war decades the number of faithful regularly attending church services was relatively high. Thereafter it began to fall, mainly as a result of the declining number of post-war immigrants and the lower level of church attendance among their descendants. The main exception to this trend is in London, where church attendance has increased significantly since the 1990s with the arrival of the new immigrants from Ukraine (many of those who live away from London have settled in locations where there are no established Ukrainian communities). In 2017 the total church attendance in the Eparchy as a whole was around 3,000 on a typical Sunday (about 1,800 of this number being in London), rising to about 13,000 on major feast days. For many years there have been nuns of the Ukrainian Graeco-Catholic congregation of Sisters Servants of Mary Immaculate based in Great Britain, all of whom have arrived from various other countries. The first group settled in Bradford in 1957, and others have been based in London since 1963. In mid-2017 there was one nun living in Bradford and two in London. The UCC-GB is active in the field of supplementary education within the Ukrainian community in the UK. In 1951-56 a supplementary school was run by the parish in Bolton for the teaching of religion, the Ukrainian language and the history of Ukraine (subsequently merging with the school run by the local branch of the Association of Ukrainians in Great Britain). From 1958 until the 1990s a similar church-based school was operated by the Sisters Servants of Mary Immaculate in Bradford. At various times priests and nuns have taught religion in Ukrainian supplementary schools in towns and cities where such schools have operated. In recent years the teaching of religion has generally been based at church premises. The UCC-GB has also been active in the field of publishing. Between 1948 and 1975 it published the Nasha Tservka (Our Church) magazine. This was succeeded in 1977-1987 by a bulletin entitled Tserkovni Visti (Church News). In 2007-2008 four issues of a revived Nasha Tservka were published. Photo: UCC Cathedral in London. The UGCC is a self-governing (sui iuris) Byzantine-rite сhurch in communion with the Apostolic See of Rome. It has been in communion with Rome since the Union of Brest of 1595-96, at which time most of Ukraine was within the Polish-Lithuanian Commonwealth. After the partitions of the Commonwealth in 1772-1795, which left Ukraine divided between the Russian and Austrian (later Austro-Hungarian) Empires, in the nineteenth century the Church was dissolved in the Russian Empire, but continued to exist in Western Ukraine. The name “Graeco-Catholic”, which alludes to the Byzantine (“Greek”) rite, was introduced in 1774 in the Austrian Empire to distinguish the UGCC from the Roman Catholic and Armenian Catholic Churches. In 1946 in Western Ukraine, which was annexed by the Soviet Union during the Second World War, the UGCC was officially dissolved, though it continued to function clandestinely. In November 1989 the UGCC in Ukraine was legalised and since then has re-established itself throughout the country. In August 2005 the seat of the head of the Church was transferred from Lviv to Kyiv. As a result of the emigration of Graeco-Catholics from Ukraine at various times, the UGCC also functions in many other countries of the world, especially in Eastern and Western Europe, North and South America and Australia. After the Second World War, in some countries outside Ukraine (including Great Britain) the name Ukrainian Catholic Church was adopted to designate the UGCC. In January 1963 the then head of the UGCC, Yosyf Slipyi, was released from 18 years’ imprisonment in the Soviet Union, on condition that he leave the USSR. In February he arrived in Rome. In December, the Holy See confirmed that, as Metropolitan of Lviv, he held the rank of major archbishop (in January 1965 he was also appointed a cardinal). In November 1964 the Second Vatican Council’s Decree on Eastern Catholic Churches essentially equated the rights of major archbishops with those of patriarchs. Back in 1963 Yosyf Slipyi began to lobby for official recognition of the UGCC as a patriarchal church, and subsequently a movement in support of this aim arose in various countries. In 1975 Yosyf Slipyi began to use the title “patriarch”, but most of the UGCC bishops in the diaspora did not support this move (the Second Vatican Council’s Decree on the Eastern Catholic Churches stipulated that a patriarchate could only be created by an ecumenical council or the Pope). In Great Britain, bishop Augustine Hornyak did not support Yosyf Slipyi’s action. This resulted in a deep division within the UCC-GB and led to the bishop’s resignation in 1987. In 2002 the bishops of the UGCC in Ukraine and abroad submitted a unanimous request to Pope John Paul II for official recognition of the Church as a patriarchal church. In anticipation of an eventual positive response, the institutions of the UGCC have since then been organised in accordance with the requirements of a patriarchal church, and its head is widely referred to as patriarch, albeit unofficially.